Even patients’ warmest relationships with staff can’t provide what mates and mums can – not least for obvious reasons of appropriate boundaries! Being in hospital, and specifically a mental health hospital, makes contact with friends and family very welcome for most patients. The hugs, the concern, the latest anecdotes about what the kids have been up to, the chocolates and magazines. But visiting or even speaking on the phone with a loved one who is acutely ill can be daunting and distressing and staff can do much to ease this experience. Providing information and support not only helps friends and relatives understand and cope with what is happening, but also prepare for when the patient leaves hospital and may well be relying substantially on their help to manage back home. For some friends and relatives, it’s a huge relief when their loved one is admitted into hospital. They may have been really worried about the person’s state of mind and ability to continue coping at home, and may (especially if they’re the person’s carer) be desperate for a break from the responsibilities and anxieties. But alongside this, they’re likely to have all sorts of questions and fears about the person’s condition and the conditions they’re experiencing as an inpatient. It’s easy for patients and staff to forget how scary it can be to have to wait for the ward door to be unlocked, and then suddenly to find yourself even temporarily secured in a ward with not only your loved one but a whole load of other people, some of whom are behaving very unconventionally. As ever, a cup of tea ideally accompanied by a biscuit and chat goes a long long way to helping visitors feel welcome, safe and confident, about themselves and their loved one. The issue of confidentiality often soon arises, even with the most general of questions like “So how is Bev doing?” Ward staff are usually very skilled at responding in a way that is in keeping with the patient’s wishes about who they want to know what, and there are some good resources (see below) with practical examples of how to handle confidentiality. As well as the crucial role that patients’ friends and family play in their lives and therefore their recovery, there’s also the importance (and legal requirement!) to provide information and support to carers themselves. The Trust’s comms team may take a leading role in providing printed information and forensic services often have social workers involved. But most of the responsibility (as ever!) remains with ward staff themselves and with their networks of contacts and services. Sometimes they bring their kids, And my foster boys’ mums bring them. I suppose my friends’ laid-backness about hospital is part of the package of them being very accepting of and understanding about my stupid illness and all the self-destruction that goes with it. Combined with enormous relief, which some of them talk to me about, that I’m now somewhere safe and supportive. We’ve had some very hilarious visits, including with a colourful range of impromptu contributions from other patients, and these remain some of our favourite anecdotes. Hospital visits and experiences are very bonding! The visit I was most anxious about was from my father on my first hospital admission. I was on special obs and on top of all my other frustrations at this caring but clumsy practice. I was terrified that Dad would know I was being specialed. 8 years on, I’m now not quite sure what my concern was about – whether to protect Dad from potentially being very upset and worried about why I would need what he would see as a minder with me 24/7, and/or because this was a significant ratcheting up for me of the humiliation I experience being specialed. Anyway, the point here is that we came to a compromise where the nurse sat unobtrusively outside the room while Dad visited, and if he did notice anything, he didn’t let on. Too busy compiling a list of chocolates and magazines to bring in next time! Create a space, notice board or area on the ward just for carers. Display useful advice, ways to get involved and tips. One member of staff is a carer support link person. There is a Carer’s information pack on the ward that can be provided to the Carers depending on what info they request. Named nurses provide relevant information to the family and carers. Apart from visits, patients stay in touch with their children via having leave, writing letters, regular phone and Skype calls, sending and receiving pictures and photographs. Making cards, small gifts in OT and arts’ sessions. There’s a fabulous scheme in some prisons – Storybook Dads, which helps sustain the vital emotional bond between prisoners and their children by through the men recording bedtime stories on CDs and DVDS. On admission it is identified whether or not the patient has children of their own, and if there are other children in their lives who they want to be in contact with during their admission. There’s a conservatory which is a family visiting room. The family room has lots of big plastic toys, donated by League of Friends. The Trust gets discount from Early Learning Centre. The family room can be booked which helps monitor children visiting. Nappy changing facilities and a toddler toilet are available in the room next door to visiting room. Patients’ artwork is on display in visiting room and corridors. Patients have planned to use the games in the Visitors Room for when befrienders come to visit them. Communication about visiting arrangements: including in patient information booklets, (attractively and welcomingly!) on noticeboards, through carer support networks etc. Visiting times are flexible to make it possible and comfortable for another adult to bring kids in to visit. We have a fantastic family room within the unit which can be used from 9am to 9pm. If it’s okay for the patient to leave the ward, it’s just a matter of bleeping the unit co-ordinator to unlock it. There’s a family room on each ward and it’s close to the main entrance so children are safe and don’t through the main ward. Our shiny new bespoke Child Friendly Visiting room provides a discreet, safe environment for patients to meet with their families and friends away from the busy ward; providing them with the privacy and dignity that we believe all families have the right to expect within an acute Inpatient setting. All furniture, fixings and toys have been purchased specifically for this area, with children aged up to 8 at the forefront of our minds – oh what fun we had! A ‘Family and Carer’s Information Brochure’ has been produced. The brochure covers a range of relevant topics such as information on the Mental Health Act, Care Programme Approach to what carers will be expected to bring when they visit the unit. The ‘Carers Dialogue’ group provides a forum where carers and relatives of service users can meet with the management and staff caring for their loved ones on a daily basis. The ward has a video-link to help patients maintain regular contact with their family members. The video-link meetings are facilitated by the Carer Avocate. This enables patients and carers to speak with and see each other regularly via the link. A carer event was held to help provide information. Carers reported that it was helpful to see the environmnents patients lived in and it helped put them at ease. A carers newsletter is regularly produced. Patients are encouraged to invite their relatives to their CPA, to utilise the visitors room, to have visits in the hospital grounds or to go out with their relatives with staff support if required. 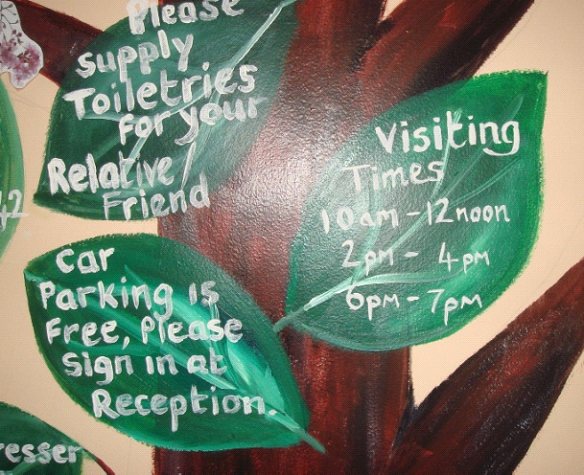 Visitors are encouraged to visit outside of therapy times, but it is recognised that this is not always possible. Depending on the individual we try to ensure that family visits can assist with the patients individual therapy programme so that relatives have a direct involvement. This is demonstrated by one patient where his father takes him out during therapy time, but the patient will assist his father in DIY tasks which goes towards his vocational aspects within his programme. A relatives Support Group is in place with attendance by the MDT, all visitors are provided with information about the hospital including the patients guide. All patients have a named nurse and key worker who will support the patient in making contact with their families. Likewise there is an expectation that the patients home community team will be involved in this process. Patients will agree a budget with their Occupational Therapist, this money is provided by the hospital. Patients are, when required, encouraged to utilise some of this to enjoy activities with their relatives, whether that be meals outside of the hospital or other specific events. All patients are provided with the Patients Guide on admission which includes advice on visiting arrangements. Visitors are encouraged to visit outside of therapy times if at all possible. Patients are encouraged to invite their relatives to their CPA, to utilise the visitor’s room, to have visits in the hospital grounds or to go out with their relatives with staff support if required. There are two visitors’ rooms, one of which is available for children’s visits if required. All patients have access to religious and spiritual leaders who will be asked to meet with those patients who do not have visitors, if the patient wishes. “It can be difficult on the ward to attend to anything other than the immediate situation, risk or management issue. The reality is that friends, relatives and carers do get overlooked in terms of their own well-being and the key connection they have to the patient. I think it’s sometimes taken for granted that the patient has someone significant in their lives ‘out there’. But this isn’t always the case and if it is, they are ‘out there’, detached, cut off from the patients’ world.I’ve experienced sad but admirable scenarios where mother and daughter almost take turns coming into hospital. When one is the patient, the other is the visitor. When mother is poorly, the daughter is carer, and vice versa. For periods of time, it’s a constant interchange of a variety of feelings and experiences for them both.I think also, certainly in my experience, there’s a tendency to assume that the visitor is okay…’together’, clued-up, exempt from emotional distress, and understands what’s going on.The reality is wards can be scary, chaotic, contradictory and confusing places for everyone. Simply being mindful of visitor’s possible perceptions, reactions, feelings and thoughts goes a long way. Giving reassurance, ‘checking-in’ and making yourself available in the moment can prevent the build up of anxiety and anger.For those who don’t have any friends or family, consider utilising advocates, ward volunteers and befrienders. Also, don’t underestimate strong connections and closeness with people in their life like CPNs and social workers etc. Patients sometimes speak very fondly (in the appropriate sense) about community teams and professionals, especially if they’ve known them for years”. Providing good information in an accessible way is a challenge for all wards – and the team on this ward have devised a new and creative way of providing information to service users and visitors. The information can be washed off easily, which allows them to keep the information up to date and relevant to people’s needs. Information displayed includes visiting times, phone numbers, and what to bring to the ward. I love writing letters to friends and designing cards for them. And I don’t have to worry about finding a post-box because the staff put it in their mail system! My Dad would come in and take my for long walks in the local area in the afternoons. I kept in contact with my friends by text until I felt well enough to see them. They really understood. My sister is looking after my children. It means I know they are safe and I can concentrate on getting well. Sometimes my visitors would stay for too long. It’s ok to ask visitors to leave, especially if you are feeling tired. Remember you are your number one priority. I gave information leaflets about my diagnosis to my family and friends. It really helped them understand where I was coming from and that given time and support I would return to being me. I wrote a letter to my partner letting him know how much I loved him and thanked him for always being there for me. My family were really involved with my care. They were given regular updates about me which stopped them worrying. The people who really mattered in my life bothered to come and visit me. That confirmed who my real friends are and strengthened our relationship. As I got better my girlfriend could see we still had a future together. Her love and support kept me going. When my mind was whizzing with negative thoughts I would open up to my visitors or staff. Taking about what was bothering me really helped. I’ve been on the ward quite a few times now. One thing I’ve learnt is to not stay in touch with too many other service users. It’s probably a personal thing but I find it too overwhelming knowing lots of people with mental health conditions. I thought my loved ones wouldn’t wait for me to get better but it turns out they have more patience than me. All I cared about when I was admitted was who was going to look after my cat. We made it a priority to get it organised. My dog never judges me. He is just simply by my side no matter what. His visits were extremely special. My dog is the one person who has never let me down. It took a while to gain that trust with other people. Once a week we had a group dedicated to keeping in touch with those not in hospital. And if we were struggling with how to do that we could help one another out and get advice. You just need to be around people who know you when you’re going through this. I was lucky enough to have friends and family come to see me every day. I think it makes a world of difference. My family have learnt a lot about my symptoms. Before I came in hospital they didn’t understand. But staff gave them information sheets which explained everything I go through. I’ve decided not to come back into hospital. I’ve learnt who the people who matter are in my life and I’m going to build my own support network around me. My family visits me every evening without fail. Knowing they’re coming in helps me focus on something good. All I could think about on admission was ‘who is going to pick up my kids and take them to their swimming lessons’…luckily there were various agencies that helped pick up the pieces and allow me to concentrate on recovering. Feeling overwhelmed is definitely one of my triggers. Before I came in I felt overwhelmed by almost everything including looking after my kids. The ward served as a safe haven. Some people might think it’s a copout but for me I needed that safe distant in order to feel safe. Most people like seeing their family but I don’t. I like seeing my friends and they were made to feel very welcome and when I had my leave we had already planned a fun afternoon out with the help of my key-worker. My decision not to have any visitors is as important to me as having lots of people visiting them is to other patients. The staff make sure there’s a room for me to see my family when they come in. I couldn’t make my appointments outside of the hospital so my appointments helpfully came to me. They didn’t seem to mind and it meant I could spend my leave doing fun things with my family. The Triangle of Care has been written by the fabulous carer activist Alan Worthington.